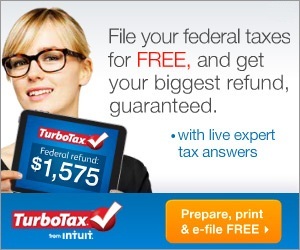 SARAH'S BLOG OF FUN: File Your Federal Taxes For Free With Turbo Tax!! File Your Federal Taxes For Free With Turbo Tax!! With TurboTax you'll get your biggest tax refund guaranteed, with 100% accurate calculations, free help, and step by step guidance so you are confident your taxes are done right. TurboTax is the #1 Rated, Best-Selling tax software brand year after year.